Arsenal have extended their lead against Huddersfield right on the stroke of halftime after some lovely play which put the ball on a plate for Alexandre Lacazette. 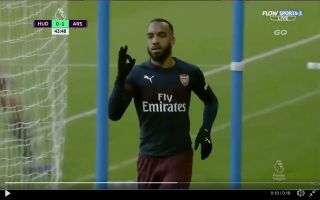 Alex Iwobi launched a counter-attack for the Gunners by playing a lovely pass forward, Henrikh Mkhitaryan’s attempt to play the ball into Lacazette was blocked and the Armenian managed to recover the ball and shield it from three Huddersfield players before laying it off to Ainsley Maitland-Niles. Niles’ low cross put the ball on the plate for Lacazette and the Frenchman tapped the ball into the net. The Gunners look levels above this Huddersfield side, this is the kind of performance that fans have been crying out for and it shows that the team’s hopes of a top four finish aren’t over just yet.